Last Christmas my friend Rosie sent me a christmas message by Granny O'Grimm. I had no idea who Granny was and it was then I discovered on Youtube her story of Sleeping Beauty. I thought it was one of the funniest things I've seen in a long time. At the time I didn't post the clip to my blog but I wish I had! 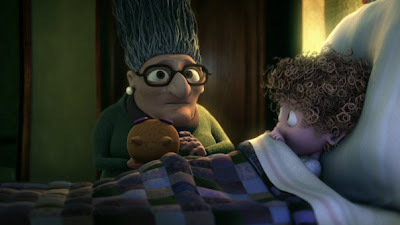 This Sunday, with the help of' God, Granny may win the Oscar for Best Short Animated film. For anyone who hasn't seen it yet here it is. Fair play to the makers, Brown Bag Films, that this film is still easily embedded in blogs and websites all over the world. There are Irish connections to 5 Irish nominations this year including The Secret Of Kells for Best Animated film. Some day Ireland may have a government that acknowledges that there are talented and creative people in this country and who celebrates them long before they have to go international by themselves to do so. Brown Bag Films fab website is here. Here's how Granny reacted to her Oscar nomination.